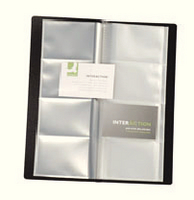 Business card holder for a stylish and practical solution to card storage. Eliminates the possibility of accidental damage. Makes finding business contacts simple. Transparent plastic reduces the need to handle your cards. Holds up to 160 cards. Black. Approx Dimensions (CM): D26 W11.2 H1. Approx Weight (KG):0.1101.